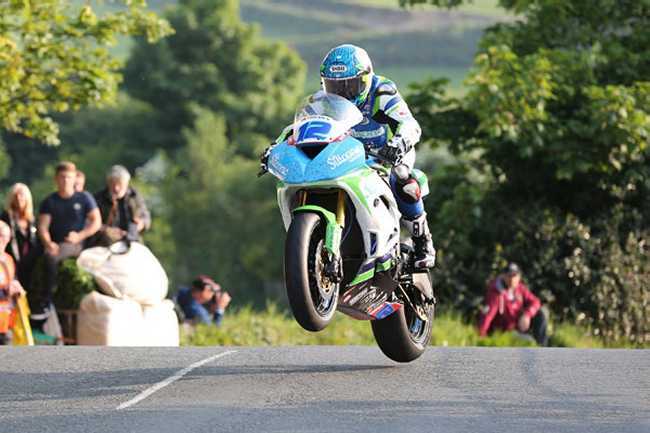 Bradford racer Dean Harrison topped the Supersport leaderboard on the opening night of qualifying at the 2016 Isle of Man TT Races fuelled by Monster Energy. Harrison clocked 124.218mph (18:13.467) on his sixth and final lap of the session while Ivan Lintin topped the leaderboard in the Lightweight after posting a lap of 116.773mph. The session began with the speed controlled newcomers lap at 6.20pm and TT Rider liaison officer Richard Quayle led Alessandro Polita, Michael Booth, Seamus Elliott and Jochem van den Hoek around the mountain course for their first closed road lap. 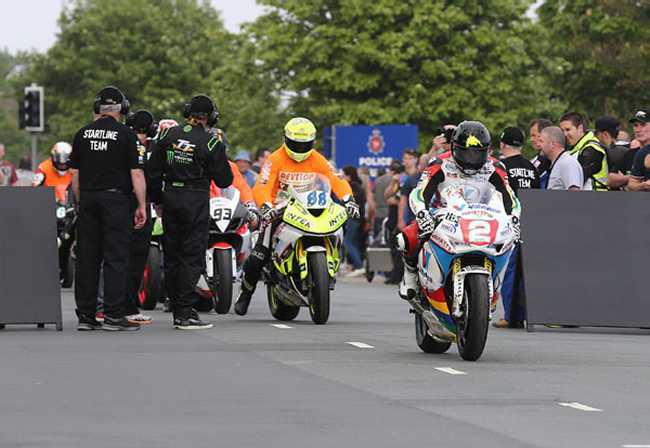 Bruce Anstey escorted Josh Daley, Andre Pires and Forrest Dunn with rider liaison officer John Barton leading the final group of Darren James, Olaf Romijn and Alastair Fagan. The sidecars newcomers followed soon after on their speed-controlled lap as Roy Hanks left the line with Dave Demott/Kevin Jones, Alistair Hawkins/Ben McBride and Peter Founds/Jevan Walmsley. John Holden/ Andy Winkle showed the way for Lewis Blackstock/Patrick Rosney, Mick Alton/Chrissie Clancy and Gary Knight/Daniel Evanson and Tony Baker/Fiona Baker-Milligan took Peter Essaff/Jeff Gillard, Simon Gilbert/Marc Maier and Thierry Laforest/Francky Fouet for their first laps. Qualifying got underway in earnest in ideal conditions shortly after 6.40pm, with the first full session for the Supersport and Lightweight classes and Swede Bjorn Gunnarsson had the honour of leaving the line first on his Lightweight machine closely followed by Martin Jessopp, Ian Hutchinson, Gary Johnson, Dean Harrison and James Hillier on their Supersport mounts. Danny Webb was out on the KMR Kawasaki, as team owner Ryan Farquhar continues to recover from serious injury, with John McGuinness, Steve Mercer and Dan Stewart also out early on. 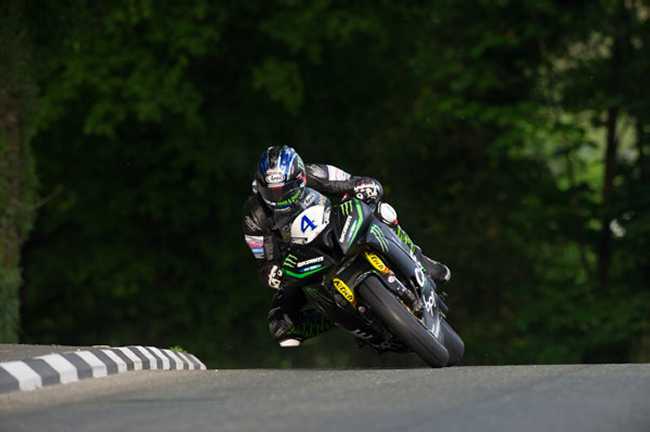 First back was Hutchinson on the Team Traction Control Yamaha at 120.280mph but Harrison was quickest on the lap at 120.800mph on the Silicone Engineering Kawasaki. Johnson, McGuinness and Cummins were all over the 120mph barrier while Cameron Donald, reunited with Wilson Craig at the TT for the first time since 2013, was also an early starter. Jamie Coward was the quickest Lightweight with a lap just over 110mph. Johnson pulled in to make changes to the gearing on the T3 Racing Triumph with Jessopp also returning to the pits after a lap of 112.158mph, the Yeovil man soon getting back out. The newcomers were also now having their first proper laps and Van den Hoek was initially quickest at 103.605mph followed by Elliott at 101.036mph. Second time around and the speeds at the front of the field increased with Hutchinson, who was now first on the road, lapping at 123.206mph and Cummins, out for the first time on the Valvoline Racing by Padgetts Motorcycles Honda at 122.616mph and McGuinness close behind at 122.550mph. Anstey, who started the session towards the back after being involved with the newcomers lap, stopped the clock at 122.257mph. The leaderboard was regularly changing and Harrison’s third lap saw him go third quickest at 122.730mph with Michael Dunlop topping the board with a speed of 123.346mph. Anstey slotted into fourth at 122.653mph with Peter Hickman improving to 121.486mph, despite not having made any changes to the bike since the North West 200. Hutchinson’s fourth lap saw him retake the top spot, 1.2s quicker than Dunlop only for the Northern Irishman to come back with a lap of 124.053mph just over three seconds quicker than Hutchinson before Hutchinson and Harrison both moved back in front of the Northern Ireland rider Dunlop on their sixth lap. Times were close though as five riders all broke the 123mph barrier with Harrison narrowly shading Hutchinson by just over half a second as the fastest on the night. In the Lightweight class, Coward had increased his speed to 111.854mph before Barton went quicker at 112.213mph. However, last year’s winner Ivan Lintin upstaged them all with a lap of 115.095mph before going quicker still third time around at 116.777mph. Newcomer van den Hoek was continuing to go well at 106.040mph before going better still with 108.109mph whilst Elliott improved to 104.997mph. Understandably, all of the riders were keen to take full advantage of the long session and re-familiarise themselves with the Mountain Course as many of them put in at least four laps, Hutchinson and Harrison completed an impressive six. Four riders came off their machines during the session; William Dunlop at Sarah’s, Forrest Dunn at the Water Works, Ben Rea at Lambfell and Seamus Elliott at Hailwood Heights but all were reported to be uninjured.